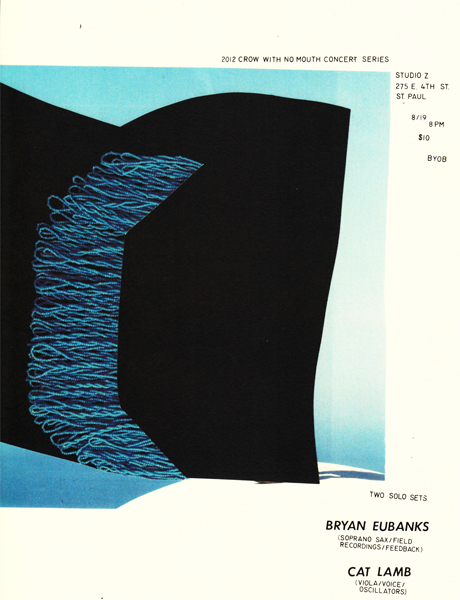 In the third event of the 2012 series, Bryan Eubanks and Cat Lamb will each present a new composition in their respective solo sets. I have enjoyed Eubanks’ music for many years; I discovered Cat Lamb this year, and have listened to everything I can find by this fine composer/performer. Lamb and Eubanks embarked this month on an extended tour of North America. Their itinerary, brief bios, and sound samples can be found here. This entry was posted in music writing on August 13, 2012 by jessewgoin.